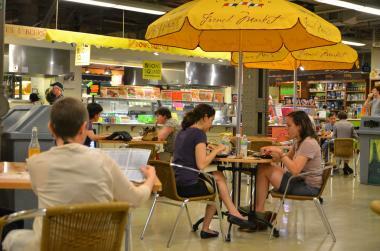 The Chicago French Market, 131 N. Market, added three new vendors in January 2013. LOOP — January is move-in month at the Chicago French Market. Beavers Coffee + Donuts, a food truck that peddles hot-from-the-fryer mini-doughuts dressed with sweet toppings, will open its first stationary spot at the indoor marketplace at 131 N. Clinton the week of Jan. 21, said owner Gabriel Wiesen. Lillie's Q, a Bucktown barbecue joint, will join the market in late January as well, its second Chicago location. The original Lillie's Q, started by chef Charlie McKenna's award-winning pitmaster parents, is in Destin, Fla. Earlier this week, the market welcomed Le Cafe du Marche, from the owner of Bistro Voltaire, 226 W. Chicago Ave. On the menu: soups, salads and sandwiches stuffed with traditional French fillings (duck confit and caramelized onion, ham and butter). The three newcomers bring to 29 the number of vendors at the three-year-old French Market. The Beavers menu at the market will expand on the truck's current offerings. There will be more toppings, with a dip into the savory side ("either prosciutto or ham and cheese, and maple-bacon," Wiesen said); doughnuts with Nutella, marshmallow, peanut butter sauce and other filled centers; a "really basic" granulated sugar doughnut; and, on Saturdays only, a chocolate cake doughnut. If that doesn't do it for you, Wiesen said more freestanding Beavers locations are in the works for Navy Pier and O'Hare. He said he hopes to open at least one of those within the next year. At the French Market, Wiesen has installed a unique ventilation system that filters the air downward. This will enable him to fry his doughnuts to order as is done on the truck (it can do so without the required city license because it operates on private property), and to replicate the Beavers concept in spaces such as airports that otherwise might not be able to accomodate it, Wiesen said. The food at the Lillie's Q booth will be prepared at the restaurant at 1856 W. North Ave. and driven down to the French Market, said McKenna. About half of Lillie's Q's regular menu will be offered, including Brunswick stew, a crawfish roll and, of course, ribs and smoked meat sandwiches. One item sold only at the French Market stand will be kettle chips gussied up with either pimiento cheese powder or the restaurant's own barbecue rub.